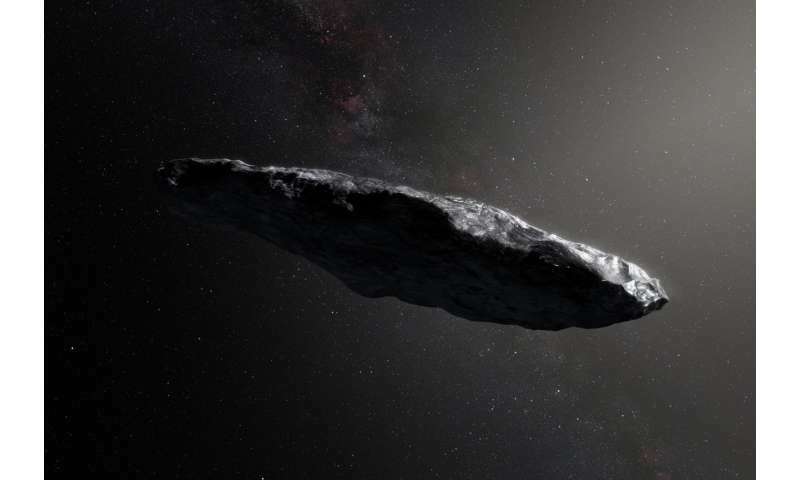 The first discovered interstellar visitor to our solar system has had a violent past, which is causing it to tumble around chaotically, a Queen's University Belfast scientist has discovered. 'Oumuamua flew through our solar system in October and was originally thought to be a comet, then it was later revealed as a cucumber-shaped asteroid. Since October, Dr. Wes Fraser, alongside Dr. Pedro Lacerda, Dr. Michele Bannister, and Professor Alan Fitzsimmons, all from Queen's University Belfast's School of Mathematics and Physics, have been analysing the brightness measurements of the object. They have been working with an international team, including Dr. Petr Pravec from the Academy of Sciences of the Czech Republic, Dr. Colin Snodgrass from The Open University and Igor Smolic ́from the University of Belgrade. Straight away, they discovered that 'Oumuamua wasn't spinning periodically like most of the small asteroids and bodies that we see in our solar system. Instead, it is tumbling, or spinning chaotically, and could have been for many billions of years. While it is difficult to pinpoint the exact reason for this, it is thought that 'Oumuamua impacted with another asteroid before it was fiercely thrown out of its system and into interstellar space. Dr. Fraser explains: "Our modeling of this body suggests the tumbling will last for many billions of years to hundreds of billions of years before internal stresses cause it to rotate normally again. "While we don't know the cause of the tumbling, we predict that it was most likely sent tumbling by an impact with another planetesimal in its system, before it was ejected into interstellar space." Until now, scientists had been puzzled that 'Oumuamua's colour varied between measurements. However, Dr. Fraser's research has now revealed that its surface is spotty and that when the long face of the cucumber-shaped object was facing telescopes on Earth it was largely red but the rest of the body was neutral coloured, like dirty snow. Dr. Fraser explains: "Most of the surface reflects neutrally but one of its long faces has a large red region. This argues for broad compositional variations, which is unusual for such a small body." The research findings, which have been published in Nature Astronomy, have helped to build a more accurate profile of 'Oumuamua. "We now know that beyond its unusual elongated shape, this space cucumber had origins around another star, has had a violent past, and tumbles chaotically because of it. Our results are really helping to paint a more complete picture of this strange interstellar interloper. It is quite unusual compared to most asteroids and comets we see in our own solar system," comments Dr. Fraser. 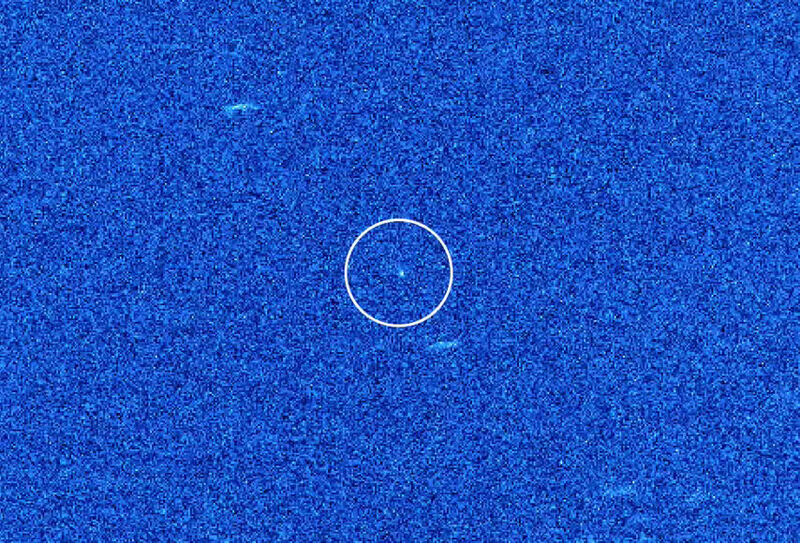 Since 'Oumuamua was spotted in October, a team of researchers at Queen's University Belfast have been analysing the object in detail. This is the third paper to be published by their team, which includes Ph.D. students Meabh Hyland and Thomas Seccull. Dr. Wes Fraser, Dr. Michele Bannister, Dr. Pedro Lacerda and Professor Alan Fitzsimmons have been supported by funding from the Science and Technology Facilities Council for their research. Oh you scientists! Spoiling the mass delusions of the rama-dama-ding-dong comicbook readers! True Believers, that almost similar fabulously fantastical hallucination and fictions must be The Truth! As I had surmised back when this discovery first became public. That Oumuama is probably the remnant core of a larger original asteroid. That got knapped, sideswiped by another big rock a few billion years ago. Before getting ejected from it's originating star system? No lights are on and nobody is home! I described to a friend a long time ago how that elongated and very similar looking object jutting out of a small crater just around the other side of the southern portion of the moon (ref: AS15-P-9625) might have arrived here. Its method of propulsion might include the rotational characteristic that confers some kind of gravity on its occupants. In its core is a traveling ballast that is propelled inside down the length of it towards the direction of travel, pushing it through space, and gaining velocity all the time. That b&w image at the top of the article, and all others like it are artist's depictions. Another conjecture might be that the thing had/has a net magnetic alignment of its minerals and has gone through multiple random interactions with multiple stellar and planetary systems' magnetic fields. "...Oumuama is probably the remnant core of a larger original asteroid. That got knapped, sideswiped by another big rock a few billion years ago..." Obviously Galactus has a hobby of flint knapping. Who knew? br, what physical evidence can you offer that would, in any way, confirm your incredulous fantasy? dR, if you are commenting about Oumuama? Not sure what you mean by minerals. Probably it consists mostly of nickel-iron metals. Otherwise, how could it hold together such an elongated shape? However, for it's mass and velocity? Magnetic fields would have had a lot less influence than passing a multitude of gravitational fields such as our Sun. TB, yeah, us cranky old neanderthals need a good knapping in the afternoon! How do you know what those scientists suggest is false? I see absolutely no suggestion in the above article that seems implausible; only reasonable theory. Are you an asteroid expert? I think you are both on the same side. I believe that rrwillsj was saying that the scientists had messed things up for the woo believers, who think this is an alien spaceship, or other kind of weirdness. Yep, we need a sarcasm font! I especially wanted to try Cursiva Hebrew. Just to watch the bigot's heads explode. Working from observation to theory is abduction. The USS Rama-dama-ding-dong should be commanded by Captain Big Foot. All the crewwomen, walking about funny, with big smiles on their faces!